I’ve been keeping one of my New Year’s gardening resolutions – the one about sitting down when I’m outside, instead of just doing frantic job after job. 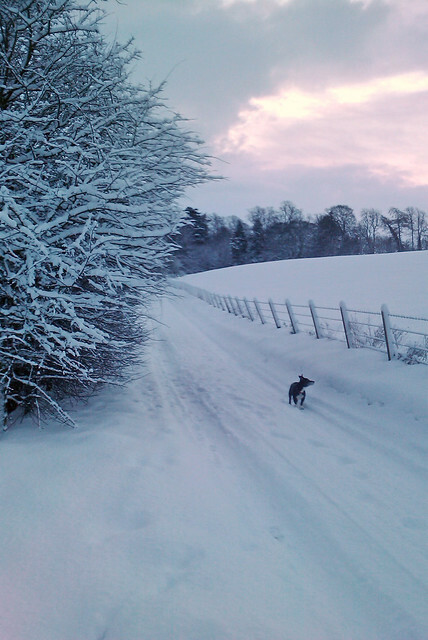 I expect I’ll sit a bit more now that my beautiful little dog, who died this morning, is buried in the garden. My mother believes that heaven is a garden. What do you think? I think it’s true for Lizzy, our lovely 16-year-old terrier cross with the comically outsized front paws. She was usually with me as I worked outside, and the other day she lazed in the sun and watched me tackling my new project. It’s a seating area; I was digging out a proper path towards a bench we never use, behind a sick apple tree. I’d removed the tree and piled up the soil by the bench; I was thinking of the Gardener’s World episode about Monet’s Giverny garden — it packs in so many flowers because the borders are mounded in the middle. When I’d placed all the plants, I sat down and watched Lizzy watching me, and I tried to take a vivid mental picture. 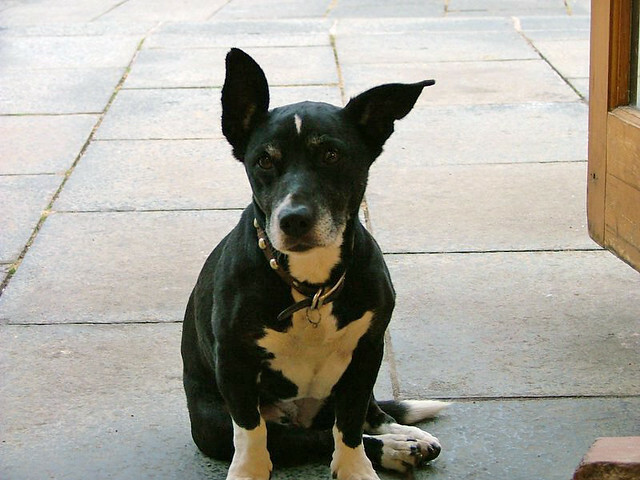 I will especially remember your wonky, silky ears, I thought — the right one always stood up, the left one folded back. If you know your dog may be nearing the end, and you want the burial to be in your garden, don’t put off planning how to do it. Lizzy’s health had been so bad that I had a bit of time to think. In fact the night before last I didn’t sleep at all. Between fits of crying – wailing, really – I made myself plan. The place for her grave was obvious – I’d dug down very deep to take out the apple tree, and the spade would go in easily there. I would beg the vet to do a house call. How could I bring her to the clinic? She hated it, and on this trip, I couldn’t lie and tell her she’d nothing to worry about. I’d wrap her in my old silk robe; it smells of me, she’d like that. And I could use the clean wicker mat I’d just seen in the closet. More crying, more sleeplessness. At 3:30 I got up, picked up Lizzy from the kitchen and brought her to the couch. She settled into the crook of my legs and we both fell asleep. This morning, when my husband and I saw how much Lizzy was bleeding and her back legs dragged behind her worse than ever, we rang the vet, who agreed to come to us. I gave Lizzy chicken for breakfast, and a long, luxurious brushing in the garden. Thank God I didn’t need to think, just do the plan: cuddles, robe, mat, grave. The rain was coming on, so I dug out the first bit; my husband would finish it after he’d dropped off the kids. He returned as the vet arrived. I sat on the ground with my robe over my legs, cradling Lizzy and speaking to her. She never liked to see me cry, so I wasn’t tempted to – I wanted her to experience only my strong, positive voice and the smell of me as I stroked her. After the first injection, a sedative, her sleepy head got heavier on my arm and she began to snore. After the second injection, she was gone in less than a minute. I kept stroking her and kissed her head; my husband finished the digging. We wrapped her gently and laid her down. This evening I spoke to Lizzy as I put in the plants: stachys byzantium, silky like her lovely ears, are by the arm of the bench. The rest is a collection of pink to catch the autumn sun: Aster Alma Potschke and Cosmos Bipinnatus Candy Stripe. A few evergreens are around the triangle edges of the mound: Festuca glauca at the tip and helleborus foetidus along the sides. When I first found Lizzy in the foyer of my apartment building, she had a plastic bag around her waist with a note: “Someone take this dog, as I can’t afford to keep it.” That’s when I was 25. I’m 41 now. It’s a lifetime, isn’t it? For Lizzy, it was a lovely lifetime; and the rest is garden. Rest in Peace Lizzie and love to you all at this sad time. A truly beautiful post. I am so sorry. It is hard to lose a dog. We lost one a month or so ago. My daughter wrote a blog entry about it, as did you. It is good to remember. We also have a garden stone and garden weather vane to remember our dog Calvin. I’m sorry for your loss, but happy for the many beautiful years you and Lizzie shared. We had a similar experience with our beloved dog recently. They always live on in our hearts. Love your use of memorial stachys, one of my favourite plants, and you’re so right, silky like a dog’s ears. Your post was lovely as was your obvious love of Lizzie. Rest in peace Lizzy. I am very sorry for your loss. May your garden grow well in honor of your special friend. Your post brought tears to my eyes. When our beloved dogs passed away at 12y and 13y, I cried so much as well. Memories with them are very much cherished and will never forgotten. I’m very sorry for your loss. From what you have lovingly written, Lizzie brought much happiness, comfort and memories into your life just as you have brought into her life. I read your sad news on twitter, and came reading here.Lizzy so mutch loved it put me to tears.She had a great life and will live forever in your hearts.Our dog is only 6 now, I count my blessings that he is still around and also with me in the garden every day. Thank you Janet – lots of tears here today, also. Blackrose – Oh thank you, I saw that on Twitter just now, really appreciated your thoughts. It’s great to know there are others like me who love their gardens and hugely love their animals, too. It’s hard to be at the desk today, I just want to go sit next to Lizzy. Tulip – 12 and 13 are great ages, but it’s never enough, is it? We always thought Lizzy would love it when the kids got old enough to play with her, but she was just that bit too old by the time they were up for a proper play. She was a huge part of my life, not sure what to do with myself now. Angie – thank you so much. I just cried and cried after writing this, but not during; writing it made me realise that I hadn’t wanted to be upset for her sake in her last few hours, and I think I was just numb most of yesterday. Greenwords – thank you. It rained most of yesterday so the stachys was drippy, but today it’s bright – I am keen to get out there and have a wee stroke of it. I miss Lizzy so much today; can’t imagine how it’s going to get any better, but I try to believe it will. Poor Lizzy. She is at peace now, and it sounds like she went in the best possible way. I’m very sorry for your loss. I believe Heaven is a garden. I believe pets are waiting at the rainbow bridge. I believe in unconditional Love. I hope there is comfort in knowing that others care. Jim — Kim wrote so well about Calvin. A stone is a great idea. Thank you. Nell Jean — so many people have lost pets; it is a relief to know this sick feeling isn’t mine alone. you’ve got me picturing Lizzy waiting now…thanks, because all day I’ve been thinking only about her beong under the ground. Your picture is great. Lizzy was a lucky dog to have you as a friend. She had a good life and she’ll always be with you… in your garden. While I’m writting this, Jonas, my Westie is sleeping on the rug, Dory, my Wired Hair Daschund is sleeping on the couch and Cleo, my miniature black Daschund is on my lap. They are my unconditional friends and I’m glad to have sharing my life. You should get a new dog soon. Jose — I can’t keep my eyes off dogs at the moment. It’s awful to be without Lizzy, but my family and I will be away a few times in the coming months and don’t want to embark on things puppyish until we are around the house for a long while without any absences. My friends has Daschs too and loves them; they are beautiful dogs. My mom has always liked the look of Westies. *sigh*. You are lucky — give your dogs a hug! I’m so sorry about your little dog, but you did give her a beautiful exit and this post is such a moving tribute. Thank you Michelle for this lovely lovely comment, you’ve made me feel a bit brighter this morning. Oh it’s hard to get used to being without her. I’m realising/remembering what grief really is: it’s like you go to lean on a leg that isn’t there anymore, and you fall, and it hurts, a hundred times a day. I’m crying reading this post. I lost my aging Westie several years ago. It was sudden – she was hit by car and died in my arms. My loving neighbor cleaned Astro up, and the next day we had a ‘funeral’ in our back yard. Astro was buried near her favorite tree. My husband made her a coffin out of left over wood, and our friends and neighbors signed the coffin before she was buried. One of my daughters even wrote a poem in Astro’s honor. Oh Audrey that’s a terrible shock for you, how awful. I wish we had done more of a funeral for Lizzy; I know you will not think that sounds crazy! The huge void after she left was awful; I went out a few days after and put the most beautiful flower in the garden on her grave. The kids have also since put precious things there (my daughter put her gnome). Do these animals know how much we care for them? I hope so! Sheila, I’m just catching up with all my blog reading now since coming back from our holidays. I’m so sorry to hear about Lizzy, she struck me as a lovely dog the couple of times I met her. The first year anniversary of the sudden and violent death of our little beloved black cat, Ben has just passed. I thought about him the whole day, but until I read your post somehow I hadn’t managed to cry about it the way that I needed to. I can completely relate to the way you talked about feeling like you’ve been stabbed and the trial of putting away her bowls – it broke my heart seeing Ben’s brother Jerry searching the house for him for days and having no-one to clean his head once he’d finished his food, as Ben would do. We waited a while and got 2 little cats – Betty and Barney – who have helped to ease the pain. Jerry snuggles up with them most days so that gives us lots of comfort too. We had him cremated and once we’ve got the garden landscaped and planted next spring we’re going to find a nice spot amongst the grasses he loved so much to put his little kitty shaped urn. I hope each day the pain reduces a little for you all – I couldn’t bare to look at photos of Ben for a long time, but I can now and when I think of him I’m now able to smile and not burst in to tears! We really are a race of animal lovers, aren’t we. Ben and Jerry — lovely names! Are Benny and Barney names from the Flintstones? I think cats break our hearts in ways that only they can; if they are outside cats, we have so little oversight of them, and we just have to cross our fingers that they keep coming home. I bet Jerry is absolutely loving having the two little ones around. Today guess what my husband gave me — a photo book with pages and pages of the best Lizzy photos. I cried and turned the pages and cried some more. She was so wound up in our life and we feel quite unravelled now. But every day gets a little easier. Ben & Jerry was inspired after visit to Ice Cream factory in Vermont a few years back. Betty & Barney are indeed Flinstones namesakes – she is black & white and he is ginger, just like their hair! Took us a long time to think of those names…! Jerry pretends to be grumpy about Barney following him around like a doting little brother, but he gives Barney’s little face a clean when he thinks we’re not watching. Glad each day is getting a bit better. The book sounds lovely. Oh Miss Dizzy Mz Lizzy … i knew her well …and i too cried as I read your lovely post to her. Thinking of her utter concentration when a ball appeared… and her quizzical look, one ear down, one ear up .. and her trotting happily along – up for anything… as long as it was with you Sheila… and she saw you through so many many times over the years … I’m glad I got to share some time with Lizzy … Dolly and me… both giving you big big hugs. Heartbreaking. But you gave her a good sendoff. I have only just found this site and read your post about your lovely little Lizzy. It made me cry, god bless her. It’s my cats anniversary today when she died and reading your post just brought it all back. I have a lump in my throat and my eyes are full. Just remember she will always be around you but not in any pain now. Thank you for leaving a comment. I feel awful when I think of the pain her arthritis was undoubtedly causing. I am very sorry to hear about your cat. Do you think they know what we felt and still feel for them? Nothing is harder than letting them go. Those plants over Lizzy look great now; time moves on but I don’t feel I have. I hope you won’t mind me coming in on this exchange. I truly believe our pets understand how we treasure them, and also that their spirits remain close to us after they have gone on ahead. Something happened at our house that seemed to us to prove this. One of our two cats had died the year before, and his brother was so heartbroken we ended up adopting a new kitten. With two young children, a kitten and an older cat, one evening the household was a bit chaotic to say the least. I said to my husband, “I never thought I’d say this, but maybe life would be easier without cats”. At this point a photograph of our dearly departed Tinker began to jump about on the wall. My son, my husband and I all saw it. There was no reason for it to be rattling around, there wasn’t an earthquake. I said out loud, “I take it back Tinker!” and the photograph stopped jumping. I don’t write all this to spook you, but because to us it was a lovely sign that Tinker was near us. He was quite a mischievous and proud cat, and rattling something to get attention was exactly the kind of thing he used to do! So I believe Lizzy is near you and that she understands and understood a great deal. I think animals understand love perfectly. I read your post with trepidation as I’ve just begun to be aware of how old my English Bull Terrier, Moo is. I’ve started planning where we’ll put her when the day comes, somewhere that I have to make an effort to step over as she’s always like a large rock under my feet and I want that to carry on after she’s gone! I hope when her time does come that I can give her as loving a farewell as you did. Thank you for sharing this moving moment with us. Dear Kim – thank you for taking the time to leave this comment. Moo – what a wonderful name. Most days, I have a cup of coffee on the bench next to Lizzy’s place and we have a little chat. I put down my hands to feel the silky lambs ears, and it makes me remember the day that I looked at her and she looked at me, and I thought about how I would remember her afterwards. I wish you and Moo the very best and I’m sure you will have time for 1000 more cuddles before arrangements need to be made! Your story touched my heart, as I too just buried my beloved cat Fluffy two days ago. I started to come to terms with the fact that he is gone. However, today it started to pour down rain. I know it is ridiculous but I cant help thinking that he is going to be in a cold wet hole. I tried to make him as “comfortable” as possible as I buried him with soft bedding, wrapped him in burlap blanket and a few special items of his. He was a beautiful White Turkish Angora with sapphire blue eyes. I had indeed planned ahead as he suffered thru 5 months of liver failure. As the end of his life grew near, the vet was amazed at how long he had lasted and was still relatively strong even though he had lost more than half his body weight. His beautiful sapphire eyes had turned a brilliant green color as the yellow liver damage took over his entire body. The steps of the process were excruciating. I dug his grave a couple of weeks prior to his death expecting that he couldn’t possible live that long. He “made biscuits” to the end and purred as he did. 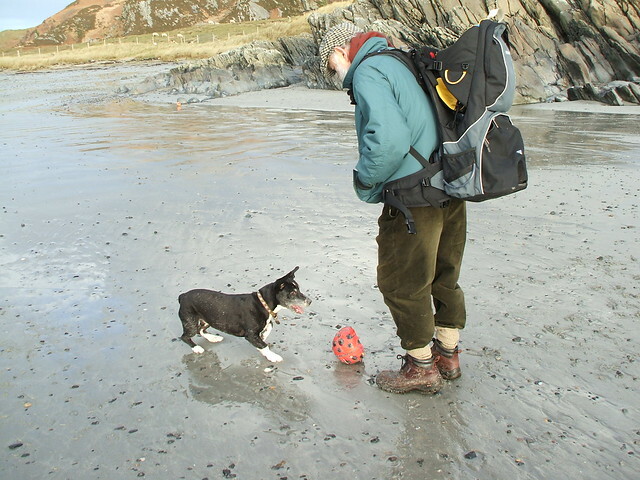 He was my constant companion and will be so very much missed! I plan to plant a big beautiful lop-head blue hydrangea as a memorial to my very special, precious baby. Your story remarkably paralleled mine and Fluffy’s story. I find some solace in knowing that I am not the only one that has these feelings that few people around me can understand. My feelings are deeply felt, not silly. Typically I am a very strong person, but his passing in my arms as I had to put him to sleep, see him face to face as the life left his still beautiful bright green eyes has brought me to my knees. I hope God will allow me to be with him in heaven one day. I never expected to be so deeply affected by his passing. I feel we are connected in our sorrow in a way that few can truly understand. Thank you for your story, it has helped me with my grieving process. Oh Joy, I’m so glad you told me about your story. Please don’t worry about Fluffy in the weather — his spirit is warm and dry, up above the ground with you throughout your garden. I feel so close to Lizzy every time I go and sit on the bench next to where I put her. I think of her every day and I don’t feel in pain anymore. It’s right and proper that there should be real, physical pain when we lose a companion but I can say truly that I don’t feel that terrible sense of loss anymore, or the pain: I feel so strongly that she is with me when I’m in the garden, which I am every few minutes of the day! I’ll be thinking of you Joy and am glad to hear about your much-loved and beautiful cat. If you want some lovely blues for other times in the year before the hydrangea flowers, try Myosotis Sylvatica Victoria Blue http://www.perennials.com/plants/myosotis-sylvatica-victoria-blue.html — you can sow seeds right now and it will flower next spring time. I planted some seeds last July and they have been the glory of my April-May garden. There is also chionodoxa, a tiny bulb that flowers very early in March, so you could have some gorgeous blues then. I have read and re-read your beautiful tribute to Lizzy. My precious Muffy, adopted (as Muffy) at 8 yrs. in 2008, left us two weeks ago. I am still as grief-stricken and can only hope it gets better. I’ll pull up this page when it gets bad and read about Lizzy’s garden spot and look at her picture. What an adorable creature she was. Mixed (as was Muffy, who had huge paws like Lizzy did, but only the front ones). I’d post a photo but I can’t yet. In time. Thank you for helping me and all the posters above for our beloveds’ departures, whenever they happen. Muffy will be buried soon in our garden and we’ll plant a flowering tree beside her (she’s being kept until this can happen). My grieving wife just lost her beautiful 14 yo german shepard, and I wanted to do something nice to both of them. I came up with the idea of burying her ashes under a flower, so she would return to us as a bright gift of Nature. Looking at google, I found a picture of a small black dog, with her head pending a little, all ears, and followed it to this post. Now I know for sure that’s exactly the right thing to do. PS: after reading this post, I went through your blog a little, and its lovely. I dont know why you stopped posting, but hope you return. Lovely to hear from you – I stopped posting last year when I became ill but I’m going to start posting again. So delighted that your wife’s German shepherd had a garden-ish resting spot just like Lizzy.